SPEAKADELIC - GAMES THAT TEACH! you often search the internet for something that will surprise your students. If any of the above apply to you, join our subscriber list and keep on reading. Congratulations! You've just become our subscriber! Join our subscriber list to get the information about out latest releases and special offers directly in your inbox. In 2018 we carried out the Cool Up Your School project. during which we visited a few schools in Poland, Czech Republic and the United Kingdom. Several hundred students tested out our games and rated them highly. We would like to thank the above schools for the opportunity to try our games under their roof. During these visits we learned a lot and in the end we introduced a lot of changes and improvements in our products. 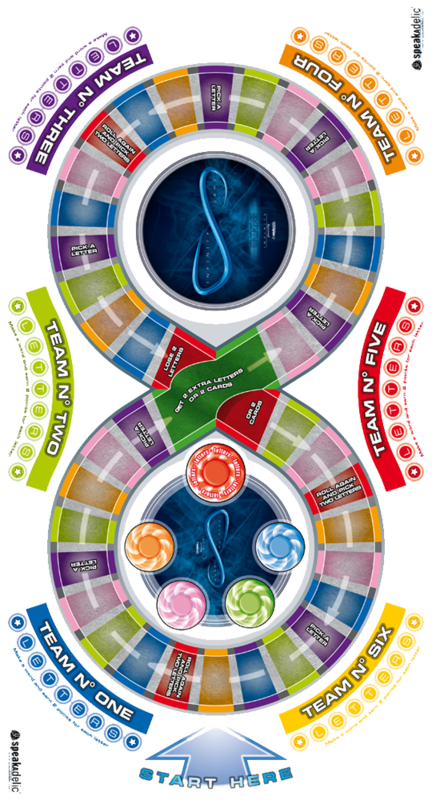 SPEAKADELIC is a creative team involved in the construction of such games, in which the fun element always goes hand in hand with the educational aspect. In the era of ubiquitous electronics and computerization, there is a growing lack of direct interpersonal interaction. The main idea behind our project is to bring people closer together and give them the joy of playing, learning and interacting with one another. Our games are mainly aimed at people directly involved in education who are looking for tried and tested and efficient solutions to enrich the curriculum and to better consolidate its scope in a light and pleasant way. We decided to start off with foreign languages and then move on to other school subjects. Therefore, we encourage you to become our subscriber even if you are not a foreign language teacher. LEARNING IS A GAME - LEVEL UP! The biggest collection of language games in one set! One universal board goes along with cards containing material of different levels of language proficiency, from beginner to advanced. INFINITY comes with a comrehensive syllabus for each of the CEFR levels. All you need to do before playing the game is select a set of cards marked with an appropriate language level. An additional benefit is the fact that the game syllabus contains a detailed description of all language presented on the cards along with their numeration and an answer key. Hence you can quickly select the material you'd like to revise using the game and put away the content that hasn't been studied by your students yet. A huge advantage of INFINITY is that the mini games included in it can and should be used independently - as a warm-up activity at the beginning of a class or as a short game aiming at revising certain grammar content. INFINITY has been tried and tested with various group sizes, from 2 to as many as 40 people. It can also be played outdoors as it's made of durable materials. INFINITY consists of around 20 different language tasks, similar to those you can find in popular coursebooks and exam papers. The game provides students with grammar, vocabulary, reading, listening and speaking practice. All of the contents of this website are protected from copying under international copyright laws and treaties. Any unauthorized copying, alteration, distribution, transmission, performance, display or other use of this material is prohibited.